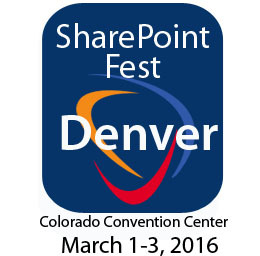 SharePoint Fest Denver to have PixelMill as a silver sponsor of this annual technology conference that will take place in Denver, Colorado, at the Colorado Convention Center, March 1-3, 2016. SharePoint Fest Denver to have PixelMill as a silver sponsor of this annual technology conference in which conference delegates will hear from keynote speakers and attend breakout sessions. Over 70 sessions will be offered across multiple tracks, as well as an optional day of workshops preceding the conference. There will also be a networking reception held at the end of the first day of the conference. PixelMill is a Northern California-based digital branding consultancy specializing in Responsive Web Design, and specifically SharePoint UI development and branding. Since 1998, PixelMill has been on the forefront of web design trends, originally as a preeminent destination for templates and for years as a trusted services partner for numerous government and corporate clientele who want to fortify their organizational and collaborative potential through increasing adoption of SharePoint. Through demonstrated expertise and thought leadership via writing industry standard books on Responsive Web Design and SharePoint branding, as well as a commitment to an outstanding level of service, PixelMill's focus on end users and branding that fits the organization has proved time and time again to increase adoption, engagement, and productivity. Attend SharePoint Fest Denver where attendees will be able to attend workshops and seminars – taught by Microsoft Certified Trainers, Microsoft engineers, and Microsoft MCM's and MVPs – covering Enterprise Content Management, Implementation/Administration, Business Value, Search, Business Intelligence, Office 365 and SharePoint Development. Attendees will be able to choose one complete learning track or mix and match based on what content best meets their current needs. At SharePoint Fest Denver, there will be sessions created for SharePoint administrators, software developers, business analysts, information architects, and knowledge workers, which will ensure that attendees walk away with as much knowledge as they desire to truly leverage SharePoint in their current environment.